Way of the Roses — All in a Day! 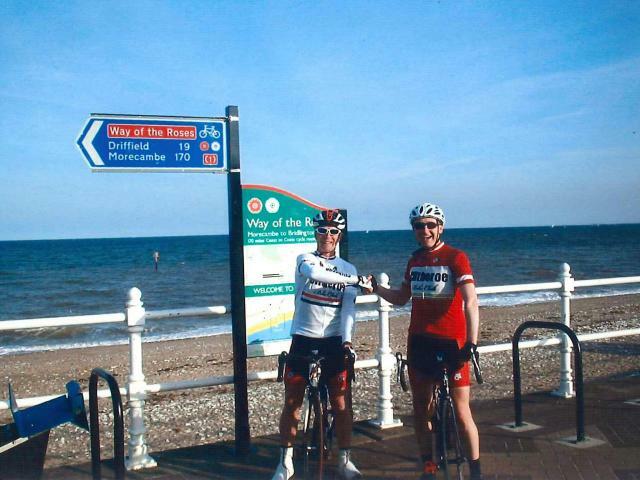 'It was primarily a fund raising effort for North West Air Ambulance and we weren’t aiming to beat any records due to the busy bank holiday and not knowing what to expect on the route - it was also the longest distance travelled by both of us by bike, in one go. We stopped in Pateley Bridge at the Wildings Tearoom just over the bridge on the right, for a toasted teacake and coffee, then at a Garden Centre just after York for dinner. The support vehicle was Ben’s parents (Tony and Jo) who met us at about 128 miles in, outside Pocklington to take photos and for us to dump the windproof jackets and thermals. We got into Brid about 6.30 and celebrated with a handshake, photo and fish and chips. Tony and Jo met us at the finish to drive us back over to the other side of the country. Looking back, one of the many highlights of the ride was seeing the sunrise over Pen Y Ghent, Whernside and Ingleborough. The route, including diversions, was well signed, easy to follow and we had no issues.